Prove that you do semi-casual like no-one else in a black velvet sheath dress. 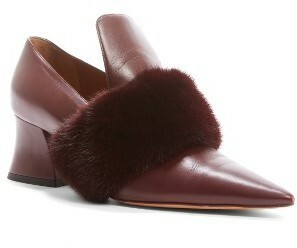 If you're wondering how to finish, a pair of Givenchy Patricia Pump With Genuine Mink Fur Trim is a savvy choice. A grey coat and white print tapered pants combined together are such a dreamy ensemble for ladies who prefer ultra-cool styles. Givenchy Patricia Pump With Genuine Mink Fur Trim integrate nicely within plenty of combinations. For a look that's sophisticated and magazine-worthy, dress in a pink tweed jacket and a burgundy pencil skirt. If you're not sure how to round off, complete your ensemble with burgundy pumps. The best choice for knockout off-duty style? A brown check cape coat with grey wool shorts. And if you want to instantly dial up your look with one item, introduce Givenchy Patricia Pump With Genuine Mink Fur Trim from Nordstrom to this look. Rock a black and white print long sleeve blouse with dark green shorts if you want to look cool and relaxed without spending too much time. And if you wish to immediately dial up this ensemble with one piece, why not complement this outfit with Givenchy Patricia Pump With Genuine Mink Fur Trim from Nordstrom? Who said you can't make a fashion statement with a casual ensemble? You can do that easily in a black floral midi dress. Givenchy Patricia Pump With Genuine Mink Fur Trim from Nordstrom are a guaranteed way to bring an added dose of class to this getup. You're looking at the solid proof that a tobacco coat and khaki leopard skinny jeans look awesome when worn together in a casual look. To add some extra zing to this outfit, add a pair of Givenchy burgundy pumps to the equation. Consider wearing a burgundy lace jumpsuit to pull together an absolutely chic ensemble. Wondering how to finish off? Rock a pair of Givenchy burgundy pumps to up the oomph factor. This combo of a light blue denim overall dress and a white off shoulder top is super easy to assemble and so comfortable to rock as well! A pair of burgundy pumps instantly kicks up the glamour factor of any getup.